While we work with a wide variety of advisors and firms, we find that they have many of the same questions and concerns. So we’ve gathered some of the most common ones here. If you have additional questions, please call us at 908-879-1002 or click here. What are the benefits of using a recruiter? And why should I choose Diamond Consultants? Nothing can have a greater impact on your professional life than making sure that you’re in the best place to service your clients and grow your business. The role of a recruiter is to help you achieve that goal by guiding you through due diligence and exploration, and serving as a negotiator and advisor in what can be a complex process. A standard in the industry, these services are available at no cost to you. 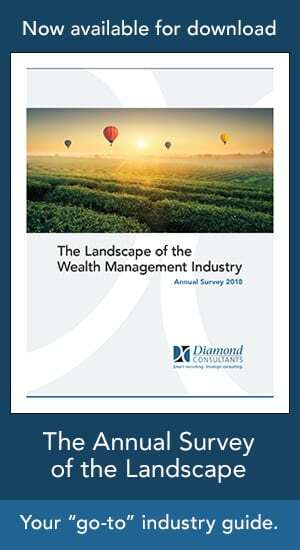 At Diamond Consultants, we pride ourselves on taking a more consultative approach to helping you achieve what we call, “your best business life.” We objectively view your business from all angles to gain a clear understanding of your needs, goals and even the frustrations you’re feeling. We ask the tough questions, then work to curate the dizzying array of options to define a focused, customized solution set that meets your specific goals. Ultimately, we streamline the overwhelming complexities and do all the heavy lifting, so you can continue to focus on running your business. And it’s a process we’ve perfected since our inception in 1997—along with building knowledge, reach and negotiation skills that are unmatched in the space. As both students of the industry and trusted influencers, we’ll keep you up-to-date on important changes and developments. And we never accept retainers from firms looking to recruit, ensuring we remain completely objective and unbiased. So whether you’ve just started to consider change or have already been exploring options, we’re happy to answer any questions you have, without obligation and in the strictest of confidence. Just click here or call us at 908-879-1002. If you move to a new firm, our fee is paid by the “acquiring” firm. It has no negative impact on the deal or compensation you will receive. Am I obligated to “do” anything? That is, what if I decide I don’t want to move? Our support and expertise are available to you with absolutely no obligation or expectation. We want to be a trusted resource and partner to you—no strings attached. And if we believe you will be best served by staying with your current firm, we will let you know and guide you accordingly. What firms do you represent? We are an independent entity and “firm agnostic,” covering the entire landscape—from the traditional brokerage, boutique and regional firms, to the entire waterfall of possibilities within the independent broker dealer and RIA space. Because we do not accept retainer fees from any firm, we can retain total objectivity. Our only mission is to find the right match for you and your clients—even if that “match” ends up with you making the decision to stay where you are. I’m concerned about confidentiality—how can I be sure that my firm won’t find out that I’m looking? We understand that confidentiality is paramount to advisors. We work with the utmost discretion to protect your privacy: We will never share your name or any identifying information with anyone, without your express permission. I’m feeling curious about the landscape, but I’m not ready to make a move—is it too early to start getting educated? We speak with advisors who are likely never going to move, advisors who are just curious about their options in this ever-changing landscape, and advisors who are frustrated with one foot out the door. It is never too early – or too late – to start getting educated. No matter what position you’re in, we believe that getting educated about your options is crucial to your continued success and happiness. I already know every manager in town and/or have friends at every firm—why should I work with you? Even advisors with large networks of contacts can benefit from having a trusted, objective partner to advise them. We can help streamline and customize what can be an overwhelming process, and will do so with your best interests in mind. In addition, we are highly skilled negotiators, ensuring that should you choose to make a move, you get the best deal possible. No, we work with advisors and firms throughout the country. I’ve just been terminated—can you help? Our first piece of advice for a terminated advisor is, “Don’t panic.” Although you will need to move quickly and be proactive in protecting yourself and your clients, termination is not the end of the road. We will do our best to help you find a new home for you and your business. You may want to read: Surprise: You’ve Been Terminated! I’m an advisor at a major firm and thinking of going independent—can you help? In a word: Yes! Independence is where the puck is heading for many advisors—even some who considered themselves “lifers” at their traditional brokerage firms. If you’re entrepreneurial and value the long-term economics, we can help guide you into evaluating and making that breakaway leap. 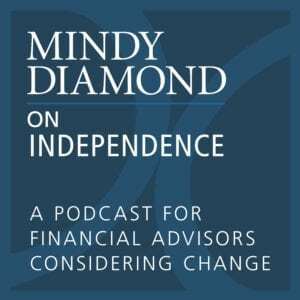 You may be interested in our podcast: Mindy Diamond on Independence. I’m an independent business owner—how can you help me? With over two decades of experience helping independent business owners grow and sustain their businesses, we are well-positioned to guide you on the path to success. Whether you’re interested in M&A, looking to offload back office minutia, searching for a capital or strategic partner, or looking for your next gen succession plan, we can help. What’s next? That is, how do I start the exploration process? If you’re ready to talk, click here to contact us or call 908-879-1002. We’re happy to answer any questions you may have—and there’s no obligation or expectation. In the meantime, we offer a wealth of information right on this website to help you start your journey. From our weekly Blog for advisors, to our Tools & Resources and our Podcast on independence—each are designed to help educate you on the landscape and the exploration process.